International students from around the world were given a taste of Britain on Thursday 24 September as Middlesex University hosted a Great British Tea Party for its newest cohort. 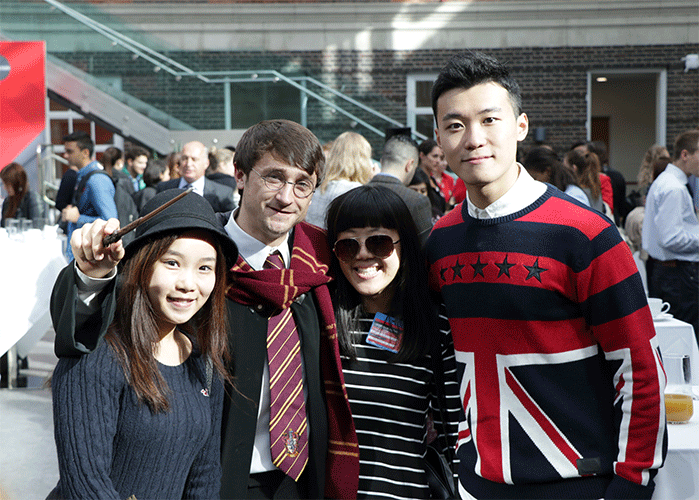 More than 300 students flocked to the Rickett Quadrangle for their welcome to London and the University, enjoying tea, cakes and sandwiches while being entertained by Harry Potter and John Lennon lookalikes. Proceedings were officially opened by The Worshipful the Mayor of Barnet, Councillor Mark Shooter, and Middlesex University Vice-Chancellor Tim Blackman. "It was a privilege to meet some of Middlesex University's newest students and to have the opportunity to welcome them to the borough," said The Mayor. "I would like to wish each of them every success in the coming years as they embark on their studies." The event was designed to introduce the students to London and British culture as well as provide a fun environment to help break the ice and make new friends. "Middlesex provides a truly global education, preparing our students for international careers and as modern global citizens," said Vice-Chancellor Tim Blackman. "It was wonderful to welcome them to our borough and community, and I look forward to watching them as they become creative and innovative graduates who are highly employable, the future's innovators, with an international outlook and a mission to make tomorrow better." The event formed part of the University's welcome to students from overseas. Over the next weeks, the students will enjoy a programme of events including a fish and chip evening, a treasure hunt taking in the sights, sounds and famous landmarks of the capital, and a trip to the historic city of Oxford.